When modelling species distribution, you can choose to model current distribution or current and future distribution patterns. When modelling current distribution you need to collect the species locality, climate and environmental data, but no scenario data is required. If you plan to model the future distribution for a species then you need to access the IPCC data distribution centre to download the appropriate data for the carbon emission scenarios of your choice. These scenarios were constructed to explore future developments in the global environment with special reference to the production of greenhouse gases and aerosol precursor emissions. The SRES team defined four narrative storylines (see the table below), labelled A1, A2, B1 and B2. Each storyline represents different demographic, social, economic, technological, and environmental developments that diverge in increasingly irreversible ways. Differences between “poor and wealthy” countries eventually disappear. There is an emphasis on education and the sharing of ideas to create more efficient technologies at a national and international level. Rapid technological developments lead to better resource usage. The increasingly educated global population becomes more affluent, has fewer children, and lives longer, supporting themselves in old age from their own savings. The increased community wealth promotes urban sprawl and densifies national and international transport networks, dietary patterns also shift to an increased intake of meat and dairy products. The global economy expands, bringing with it improvements in social and health conditions. This scenario family diverges on the topic of energy sources and conversion technologies and splits into scenario groups. The A1C scenario group assumes the use of carbon intensive fuel such as coal. The A1G scenario group assumes the use of oil and natural-gas resources. The A1T scenario group assumes the movement towards renewable energy and conceivably also nuclear energy. 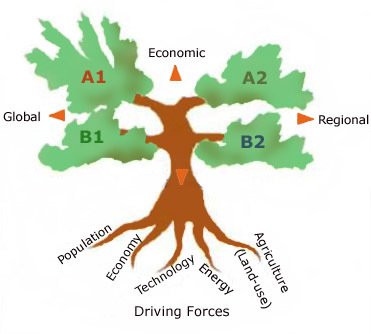 Lastly the A1B scenario assumes a balanced mix of technologies and energy supplies with no supply being overly dominant. A very heterogeneous world with continuously increasing global population and regionally oriented economic growth that is more fragmented and slower than in other storylines. This results in regions with abundant energy creating stronger welfare systems and reduced income inequality. “Poorer” regions move towards a leaner government and a heterogeneous income, while favouring technological innovation. The increased population in this scenario create an increased focus on agriculture. A global shift of consciousness to a high level of environmental and social consciousness, this motivates careful land use management and promotes compact cities. The focus falls on sustainable development. The global economy is balanced with income distributed evenly and investment focuses on the efficient use of resources. A strong welfare system minimizes the effects of poverty, while the birth rate declines due to social and environmental concerns. Increased concern for environmental and social sustainability exists, however the efforts to achieve this are undertaken regionally instead of globally. Human welfare, equity and environmental protection all have a high priority; this encourages education and welfare programs. Development and environmental protection promotes regional innovation, resulting in the investigation of less carbon intensive technology, however this remains globally heterogeneous.